This weekend was the Connacht Regional Championships held in Portumna Forest Park in Galway. A large gathering of junior squad members however first braved the icy roads and freezing forest of Knockbarron for some technical training. The training was held under the watchful eyes of IJS managers of Ruth and Greg with Darren, Marcus, Ruairi and Colm on shadowing duty as the juniors were put through there paces in sub zero tempetures. The orienteering training was wrapped up with a heated mass start looped relay event. Before retiring to Birr hostel where dinner was already cooked!! The evening was spent on lectures on how to analysis maps by Marcus Pinker (mapper). Before a talk on physical training. The Connacht Champs awaited everyone on Sunday morning. First of 11 CNOC runner into the forest was Pat Healy. No winners on the cold Sunday morning... but its the taken part that counts! At the recent event on 3rock I picked up a number of old IOA magazines. There were two articles that caught my attention. From Aug/Sept 1988:The IOF congress discussed making orienteering available for television by tracking competitors electronically through the forest. The Swedish O fed and and the IOF were working on an electronic tracking system that would display a runners position on a map shown on a tv screen, a moving blip will indicate the runners position and the computor programme will take into account topographical abnormalities like re-entrants from which a small tansmittor carried by each competitor may not be detectable by the tracking system. Those attending the meeting were impressed with the idea "IMAGINE IT" being able to monitor the race in the forest as easily as that! "This is all very good but we tried it five years ago. We also had a transmitter linked to the runners shoe so we could tell when he stopped running"
From June/July 1990 Orienteering Nass held a very succesful series of four evening events followed by a BBQ ( A Nass speciality) at Blessington. Contrary to report in TIO46 about Nass and Curragh amalgamating, Eileen Loughman informs us that the two clubs are coexisting in harmony. When did they amalgamate after this ? 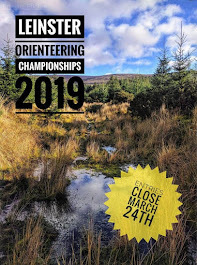 This coming weekend sees the Connacht Champs in Portumna and our junior mmembers will train in the Slieve Blooms before attending the event. Best of luck to all taking part. Today CNOCer's were racing around the forest in the Vale of Clara. We had wins, loses, miss punches and a few 180s. We had runners on all courses except for the yellow and orange. If there are any reports from the days activities, please feel free to send one on! At a quick glance, Pat H was 4th on Blue (did he map it?). On Brown, Ruairi changed clubs to DUO... chairman, try keep him on the straight and narrow. Best CNOC runner was Ruth Lynam with the two O'Boyles having a bad day at the office.On green, Dee Ryan was 2nd woman home (1st junior). While Caoimhe was showing people how its meant to be done on the Light Green coming home in 3rd place! Slightly further back on the Light Green it was a Ryan battle as younger sister Laoise just got the better of older brother Sean - surely Sean will be able to bring his A game to the Curragh and set the order straight in the Ryan household. The next event is the CROC out West. Best of luck to all our runners. The third round of the Autumn Leinster league was held today on 3rock we had a small turn out of runners. Storm clouds stayed away and did not deter the large numbers turning out. We had no runners on the yellow and orange courses. On the Light green course Caoimhe O Boyle showed a clean pair of heels to all challangers winning in a time of 51.07. Eilen Hill was our only competitor on the green course and finished down the field in 25th position after having a tough day on the hills. Ben O Boyle finished 17th on the blue course. We had all our big guns running on the Brown course with Colm Hill winning and Hugh Cashell finishing second. Senan O Boyle finished 11th and Tony Lawlor finished 16th. Brian Hill opted to run this event which proved to be a poor choice as he DNfed, there was some excuse after his exertions on powerscourt ridge run on Saturday in which he won the junior event.Don Shortt also had a poor outing by his standards as he also DNFed. For the next event we will hopefully have our international runners back to score valuable points for the club. Some pre race planning should take place so that we can spread runners over all events and hoover up points thereby moving us up the league table. I picked up some old IOA magazines at the event and will post some info on the site that may be of interest.